One statement holds true for all meta-analyses of regenerative periodontal therapy: the results show a marked heterogeneity, i.e. the results of regenerative therapy vary widely. What is the reason for this? Is it left to chance whether flap surgery with regenerative procedures, such as guided tissue regeneration (GTR) or enamel matrix proteins (EMP), results in improved attachment gain or osseous filling? Or are there factors that influence therapeutic success? One thing is clear: before planning regenerative procedures, anti-infectious therapy should be completed. Patients should practice proper personal oral hygiene and, other than the defects that are to be regenerated, residual pockets should be absent. Other factors influencing the success of regenerative therapy in bony pockets and class II furcation defects are smoking, defect depth and breadth, availability of soft tissue for flap formation, position of the furcation fornix in relation to approximal bone, and tooth mobility. This article focuses on a one-stage surgical treatment of a deep intrabony defect associated with a Miller's Class IV recession. 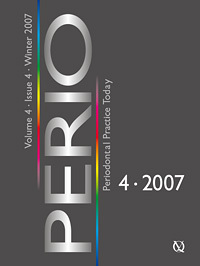 The flap design follows the principles of a periodontal plastic surgery procedure, the tunnel technique, with the alliance of a regeneration procedure using a xenograft. The comparison between initial and one-year post-surgical periodontal parameters shows clinical attachment gain, periodontal pocket depth reduction and partial root coverage. Guided bone regeneration is a valuable treatment in order to accomplish an adequate height and thickness of alveolar bone before or during implant placement. Inadequate augmentation in combination with poor implant placement may lead to bone fenestration and/or dehiscence, which may manifest clinically as peri-implant recession. The aim of the present case report is to present the management of a recession of the peri-implant soft tissue associated with bone dehiscence and fenestration. The step-by-step procedure and the clinical outcome 18 months following treatment are presented. The treatment approach comprised reconstructive surgery by means of a natural bone mineral, bioresorbable collagen membrane and connective tissue graft followed by complete soft tissue coverage of the implant. After a period of 6 months, the second-stage surgery was performed to expose the coronal part of the implant and to place the healing abutment. The thickness of the vestibular gingiva was further increased using the modified roll technique. At 18 months following treatment, the clinical and radiographic re-evaluation revealed a stable clinical situation and a satisfactory aesthetic appearance of the peri-implant soft tissue. This case report illustrates the diagnosis, treatment and long-term follow-up of a patient with ciclosporin- and nifedipine-associated gingival enlargement. The patient was treated successfully without changing his medications. The main aim of the treatment was to reduce the extent of the gingival enlargement, thus restoring dental health, function and aesthetics. Following initial periodontal therapy, a surgical phase was performed. The patient was followed for two years with no recurrence of his gingival enlargement. The exact patho-mechanisms of ciclosporin-induced gingival overgrowth remain unclear. Gingival hyperplasia is more severe in areas where local irritants such as plaque, calculus and defective restorations are present, although the role of dental plaque in the course of ciclosporin-induced gingival overgrowth is a matter of debate. A clinical case of a middle-aged kidney-transplanted woman is presented in which the gingival overgrowth was successfully eliminated by initial therapy and minimally invasive gingival corrective surgery. The patient's oral hygiene and periodontal health have been successfully controlled by regular supportive therapy for over 9 years. Background: Generalised aggressive periodontitis (gAP) is one of the severest forms of periodontitis, which if not diagnosed early may result in major loss of periodontal tissues and early loss of teeth. Gingival enlargement is an easily identifiable condition characterised by excessive display of gingiva causing aesthetic and functional problems. Gingival enlargement is rarely seen in association with gAP. A case of 15-year-old female is reported who presented with a generalised gingival overgrowth along with increased spacing and mobility in her teeth. At the first instance the case looked like a case of gingival enlargement but on detailed study of her history and clinical and laboratory findings it was diagnosed primarily as a case of gAP with pubertal gingival enlargement, later being just a superimposed condition. Methods: Treatment plan included conventional gingivectomy, extraction of teeth with hopeless prognosis, elimination of infecting microorganisms using a combination of surgical access and antimicrobial therapy with a long-term maintenance phase therapy. Results: After one year marked improvement in the patient's condition was noticed. Conclusion: Associated conditions like gingival enlargement may complicate the diagnosis of gAP; therefore, diagnosis should always be based on detailed study of the patient's history, clinical, radiographic and microbiological findings. Dumitrescu, Alexandrina L. / Pedersen, Susanne S. / Dogaru, Beatrice C. / Dogaru, Cristian D.
Aim: The aim of the present study was to determine the association of social inhibition, mood, and worry with participants' self-rated oral health and oral health-related behaviours. Study design: First-year medical students (n = 178) completed a survey that included questions on socio-demographic factors, behavioural variables, and self-reported oral health status. Students were also asked to complete the social inhibition subscale of the Type-D Scale (DS14), the Global Mood Scale, and the Worry Domains Questionnaire. Results: Significant differences were found for social inhibition, worry and positive affect according to self-rated oral health, number of extracted teeth and satisfaction with appearance of own teeth (p < 0.05). The results showed that mean levels of negative affect in individuals with poor/very poor perceived dental and gingival condition were higher than, but not statistically different from, those of individuals with self-rated good/very good/excellent dental and gingival health (18.00 ± 11.79 vs. 11.71 ± 6.49 and 16.00 ± 10.23 vs. 11.77 ± 6.41). Students with higher social inhibition or worry and lower in positive affect scores were more likely to brush their teeth once or less per day, never to use dental floss, to have last visited their dentist more than two years previously and then mainly when treatment was needed or when pain occurred. Conclusions: The results suggest that social inhibition, positive affect and worry are psychosocial risk markers that influence self-reported oral health status and behaviour and should be considered in the clinical dental setting. This cross-sectional study was designed to investigate dentine hypersensitivity (DH) and the associated risk factors in patients attending primary oral healthcare clinics in the Muscat Governorate of the Sultanate of Oman. Nine dental practitioners were calibrated against the principal investigator. Patients attending public primary oral healthcare in the Muscat Governorate and who reported DH over a period of one month were evaluated using a questionnaire and an intraoral examination. The duration, initiating factors and two visual analogue scale (VAS) records were used to evaluate patient perception of pain severity associated with dentine hypersensitivity. In addition, the pain perception following an air blast stimulus from a 3-in-1 triple syringe of a dental unit was recorded. Of the 3002 patients recruited for this study, 318 were diagnosed with dentine hypersensitivity, a prevalence of 10.6%. Cold drinks were the main initiating factor with gingival recession present in 56.7%, and cervical abrasion lesions in 12.3% of hypersensitive teeth. There was a statistically significant difference between the VAS of the pain perception of DH and that of an air blast stimulus.